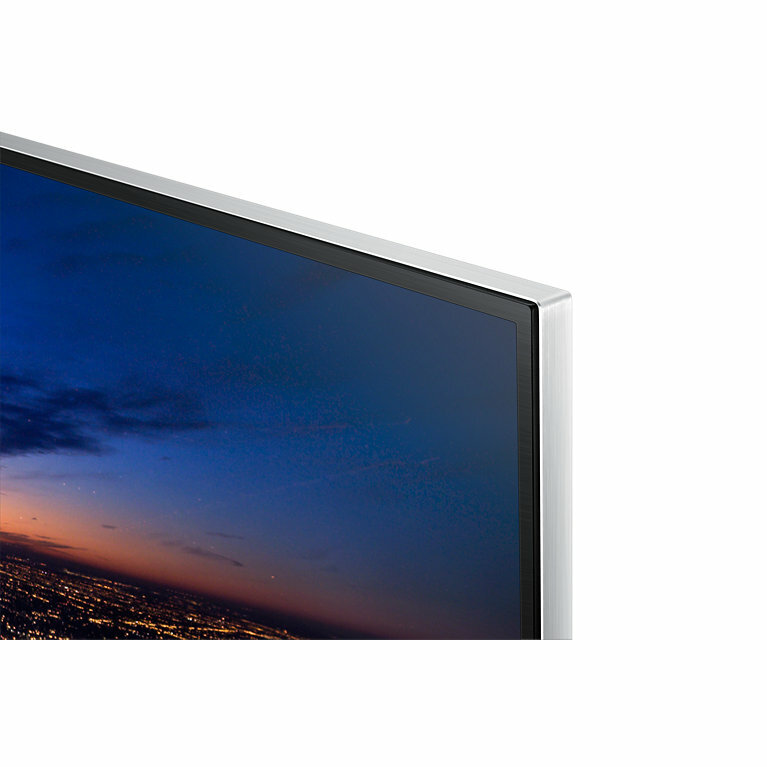 This is one of Samsung's biggest TVs available on the mass market at the moment. 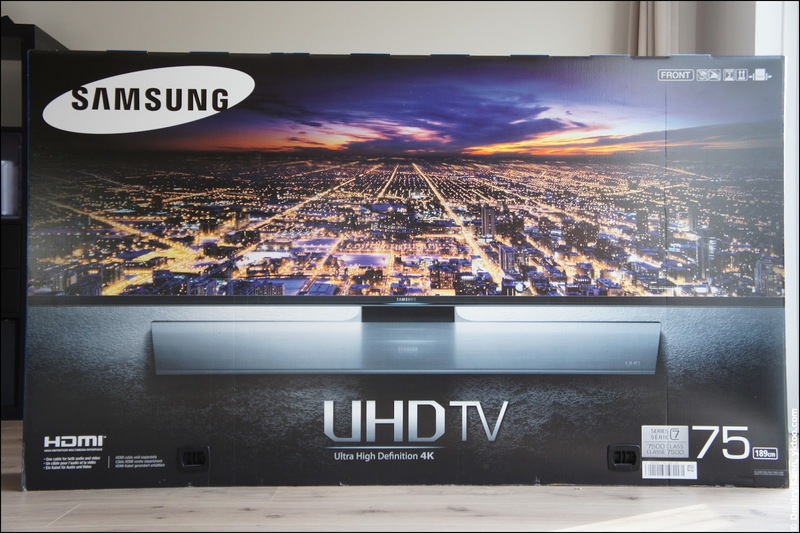 Its big brothers are curved 78" models 78JU7500 and 78HU9000, and the hyper-monster 85HU7500 with 85" diagonal, but these are far from being affordable (85 inch model is ten thousand euros). 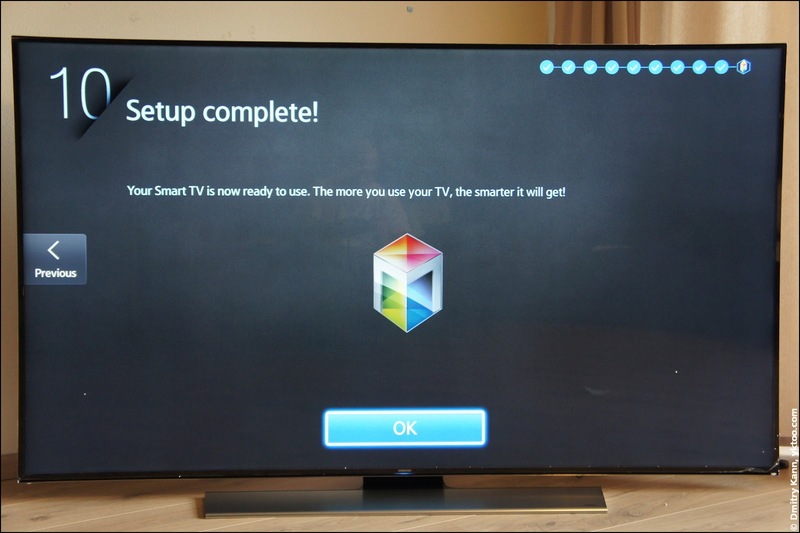 This is a (nearly) complete review of the television from a user's perspective. The review is split to several chapters as it'd be too bulky otherwise. Loads of pictures under the cut. 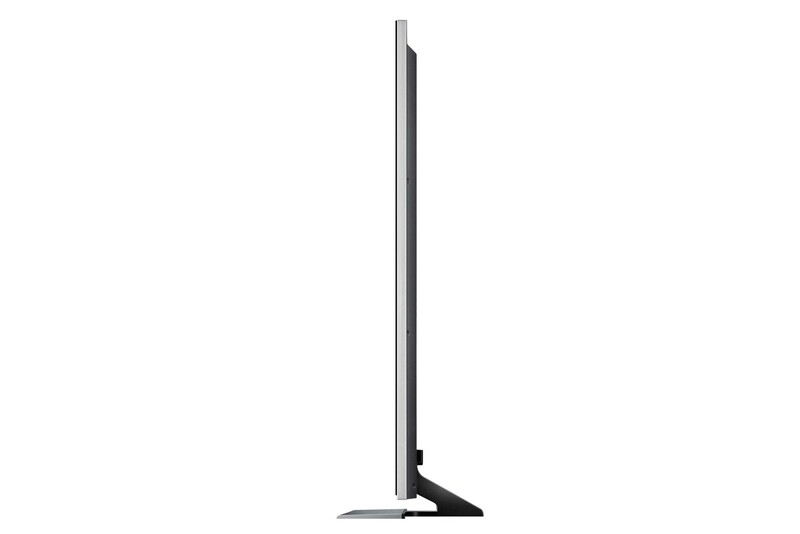 As soon as we've moved into our new house I've started thinking of a television that would match the new interiors of the living room. I'm a big fan of functional minimalism if it comes to design, so the envisioned layout was as follows: TV hung on the wall and a couch against the opposite wall. 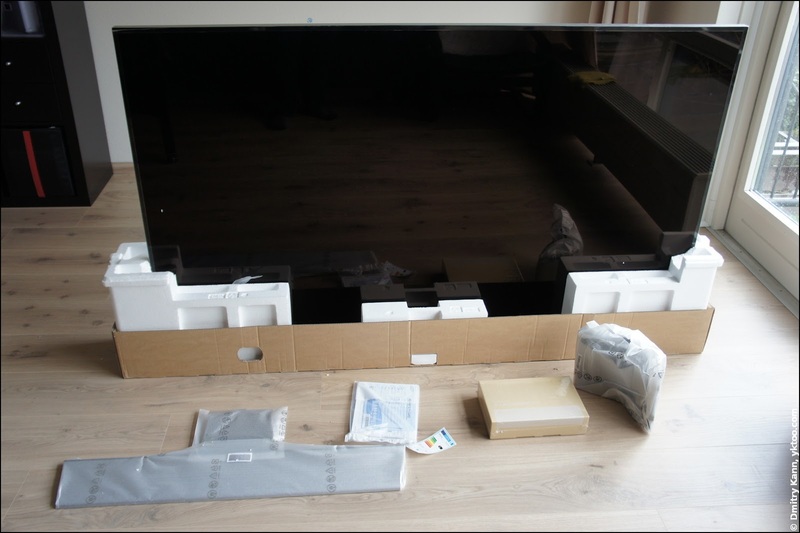 However, as the living room is five metres wide, the screen had to be at least 60-65 inch. I've immediately discarded all the curved models since they look clumsy on the wall. And, if you're planning to buy a new TV, it makes sense to have some margin for the future, and I mean the support for Ultra HD. In this regard Samsung's devices are notably cheaper than those by other vendors (LG, Sony, Philips), so that a similar model (in terms of size, functionality and quality) turns out some thirty percent cheaper. 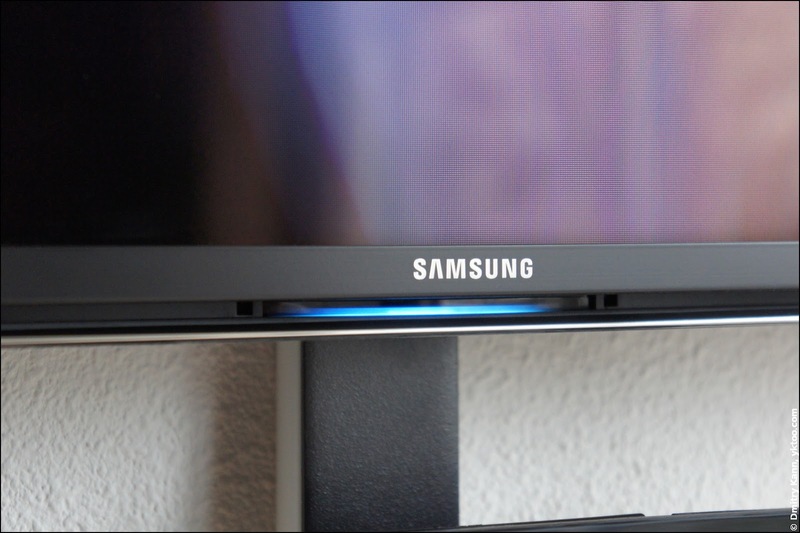 Samsung UE75HU7500 is a LED TV of the latest generation (2014 model). 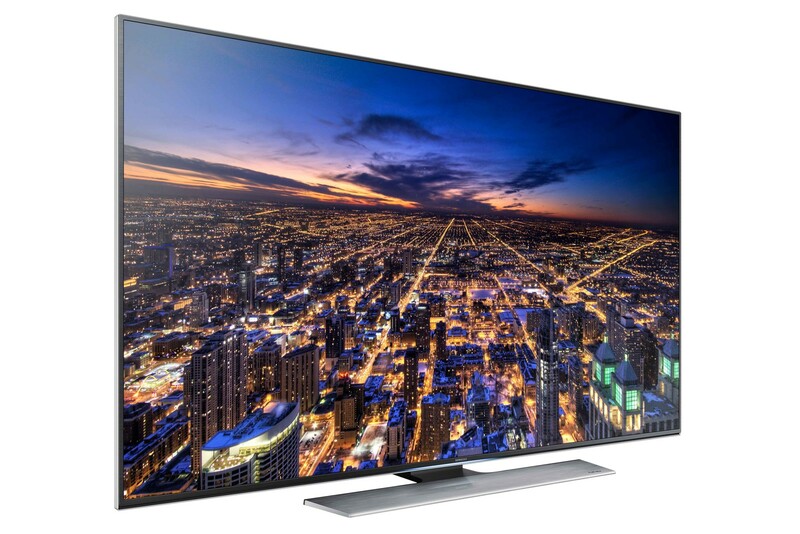 It features support for Ultra HD (4K video) and 3D video (with special glasses). So let's start off with the specs. As one might notice, it's packed with features. It's very unlikely you'll ever be using every single one of them. The cardboard box is enormous, some two metres long and one metre high. Below it's shown beside a chair. It weighs more than fifty kilograms, so don't try to handle it alone. It's also only 25 cm thick, which makes it pretty unstable. 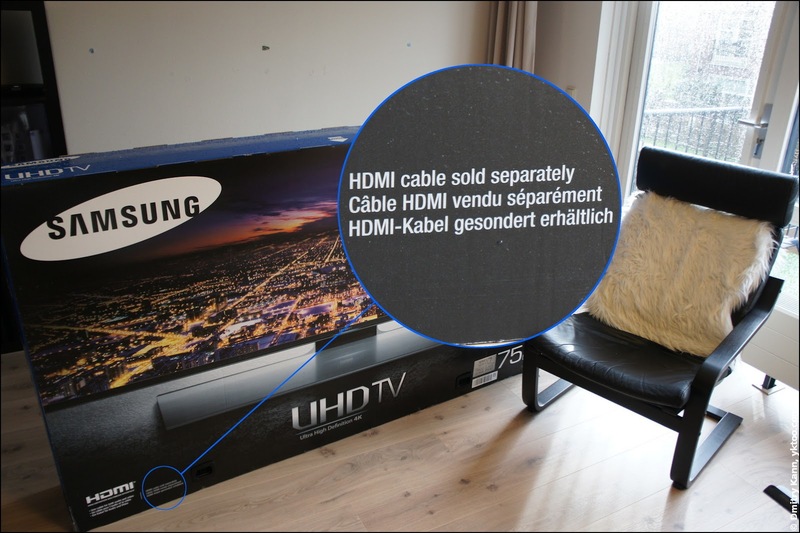 Notice the small letters—the company spared five euros by not shipping an HDMI cable with a TV of five thousand. Shame on you, Samsung. 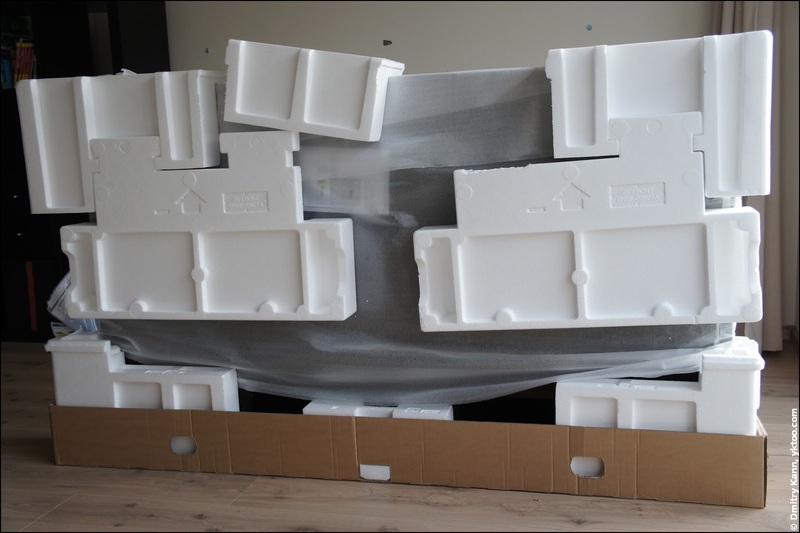 The upper part of the box can be easily pulled up after removing plastic latches below. The LED panel is held in place solely by the foam inserts at the opposite corners, so it wouldn't be a good idea to unpack the device during an earthquake. 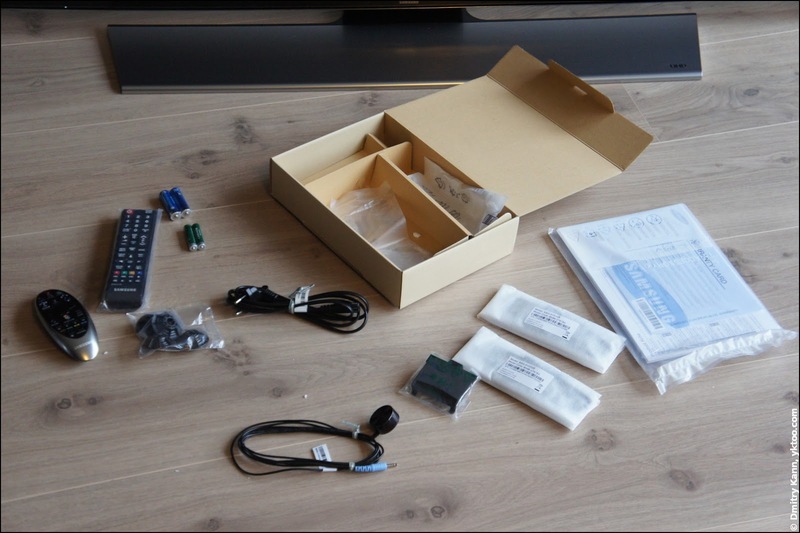 After removing the unnecessary inserts, we pull out an accessory box and both parts of the stand. Let's start by temporarily fixing the TV on the stand. 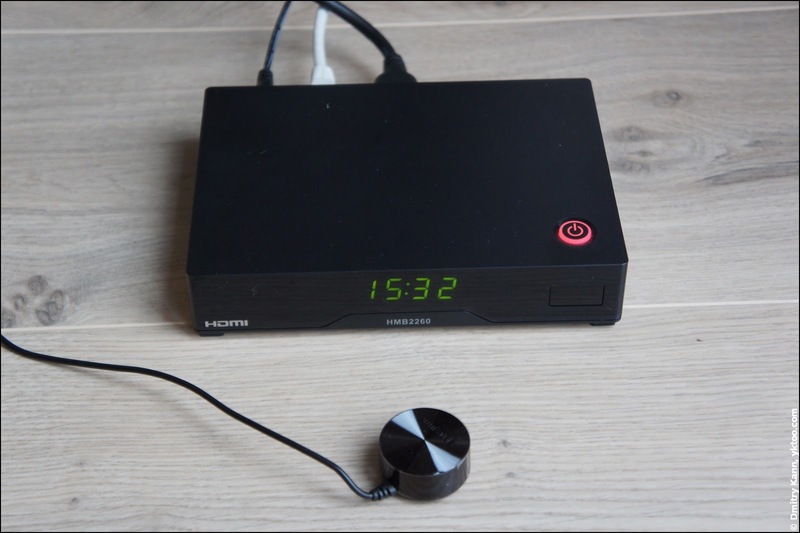 Upon connecting the device to the power, the first thing you notice is noise produced by a cooling fan. Yes, there is a fan in the TV, and you can hear it. The welcome wizard first asks for an Internet connection. 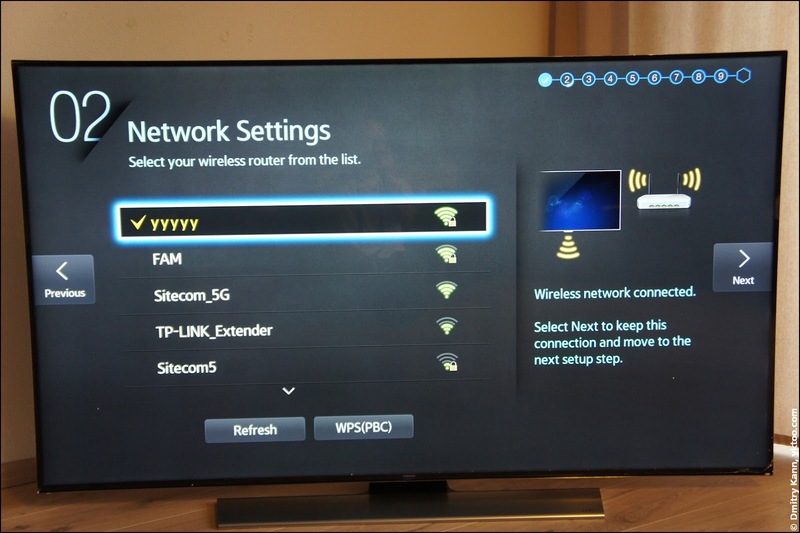 You can choose between Ethernet and wireless, which are both built in. 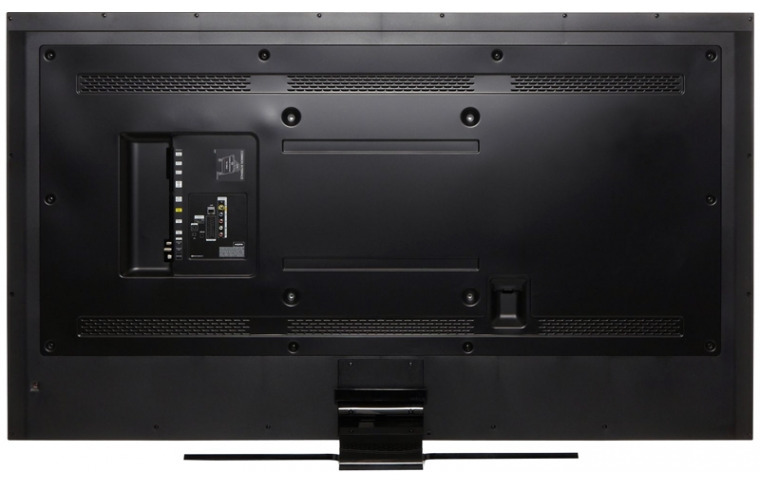 With this extender the TV can control the set-top box and other devices, by switching them on and off, changing channels and bringing up the TV guide. Which is quite handy. The tenth, final screen promises that the device will get smarter with every passing day. The monster looks pretty stylish. A very thin metal framing and no controls on the face side whatsoever. The foot made of pure aluminium weighs seven (!) kilos. At the same time, the panel is incredibly thin, only 38 mm (1.5") without the stand. The back side of the device: a connector area on the left, four VESA mount holes in the middle and a power cable socket on the right. 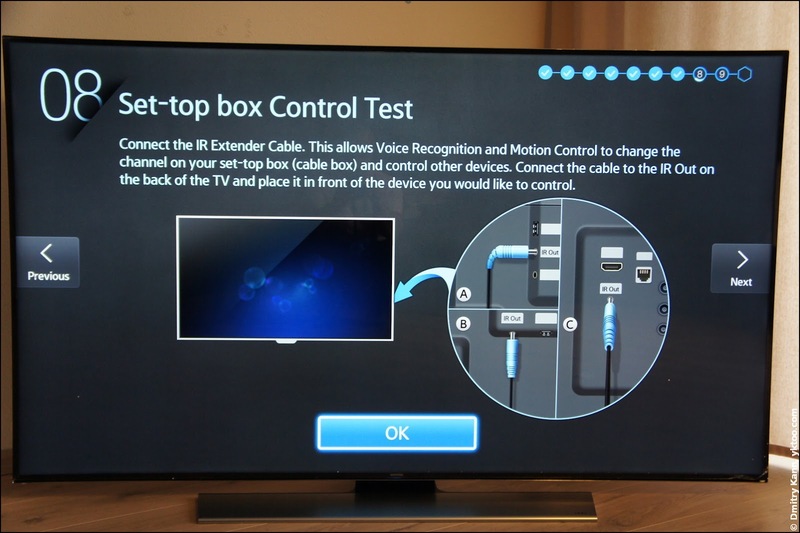 There is also a tiny joystick in the bottom left corner, which can be used to control the TV without a remote.